So how's my resolution to use my untrieds more and buy less going? Um...well...it's....uh.... I have been wearing untrieds, but the buying hasn't slowed much. Damn. My untrieds total has actually gone up. More damn. I'm right around 750 now...BUT...I'm also just about to crest the 1600 mark for my stash total. That means....tiny drumroll, please....less than half! For about as long as I've really been piling up the polish, my untrieds-to-total ratio has been slightly over half. I'm counting this as progress. I've been making a point of fishing around for untrieds when I need a base for layering and I'm now sitting on a little pile of swatches of older stuff. Let's have a look! Sally Hansen Cherry, Cherry, Bang, Bang is a fuchsia crelly. I love how Cherry, Cherry, Bang, Bang looks once it's on, but getting there is a hassle. It's sheer and very watery and runny. This is three coats. I'm 99% sure that this is one of the shades that was discontinued when they reformulated the Complete Salon Manicure line at the end of '12. I bought it in the big clearance of the old formula, at Walgreens, I think. CQ Denim is a slightly dusty blue-green cream. This photo isn't particularly accurate. My camera just wasn't having it. It's more accurate with Maybelline Blue Beats over it. If you're not familiar with CQ, well...you probably never will be. They were a part of the now-defunct Scherer and are pretty much non-existent in Rite Aid now, aside from a few clearance stragglers. This is two coats and it was a bit streaky. The color's pretty though, so if you do happen to find Denim in a clearance bin...go for it. 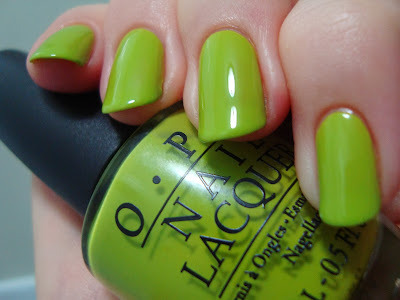 OPI Who The Shrek Are You? is a chartreuse cream. Hooray for random CVS finds! I'm sure it's slowly driving Nichole crazy, but I am so completely in love with ugly greens, chartreuses, etc, so I snatched this up when I found it. It's a bit on the sheer side, but applies well. This is three coats. Color Club Abyss is an aqua cream. This is the youngster of today's bunch. It came out last summer, as part of their Kaleidoscope collection. I bought it from enospring, partly to qualify for free shipping....but also because it's pretty. It's thick and one coat was almost enough. I wound up going with two, for evenness. 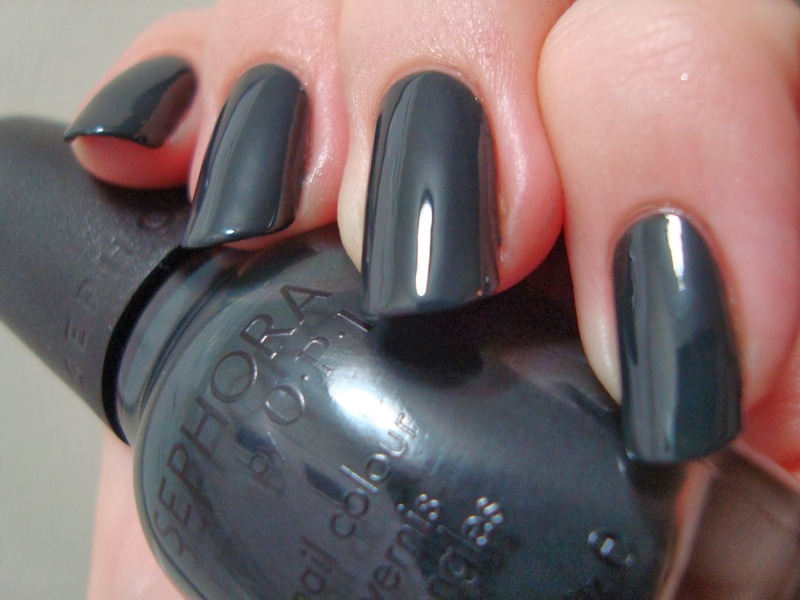 Sephora by OPI Dark Room is a blackened blue-green crelly with a hidden shimmer. One of my oh-so-many Big Lots buys. If you have one near you and haven't scoped out their SOPI selection...go....now! They're just $1.80. Can't say I warmly recommend this particular shade though. It's...weird. This is three coats and while it's watery and a bit on the sheer side, it's also a bit chalky. I've never encountered that in a shade this dark before. Worth the $1.80, but I'd never have paid more than that for it. Sally Hansen Thinking Of Blue is a blue cream. This is a flea market find and I pounced right on it! Thinking Of Blue is another discontinued shade, but from well before the reformulation, I think. It's such a perfect blue! This is two easy coats. It was my NOTD on a day off a few weeks ago and I kept smiling lovingly at it. Revlon Essence is a deep jade cream. I forgot to check if Essence is still available in drugstores. I bought it at CVS last year. It came out in the same bunch as Superstitious and Celestial FX...and I think Superstitious might be discontinued. If Essence has been, it's a damn shame. I am in complete love with it. It was my NOTD last Thursday and while I had time to top it before leaving, I just couldn't bring myself to do it! Too gorgeous on its own. It's thisclose to being a one-coater, but I used two. I think you can tell from the photo, but it dries a little darker than it looks in the bottle. It's one of so many I wish I could get away with wearing to work. I'd live in it! 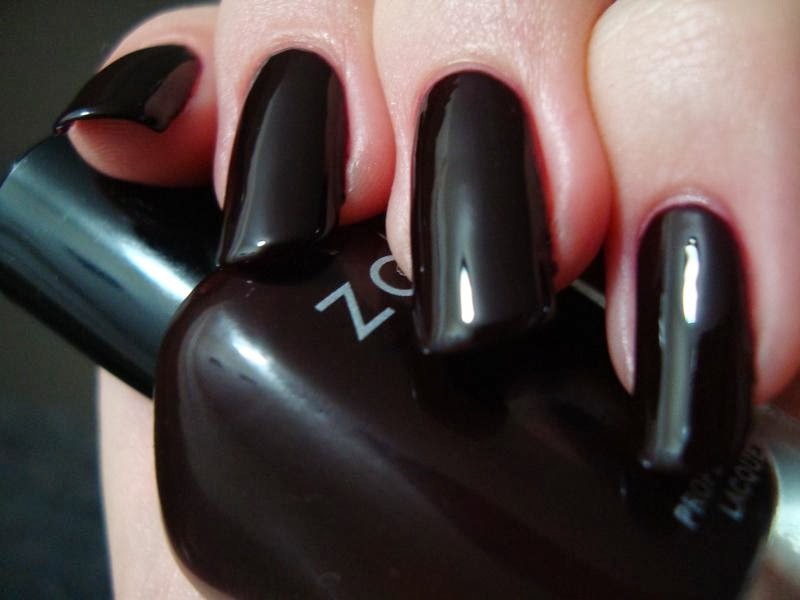 Zoya Casey is a deep maroon crelly. I don't remember when or where I bought Casey. Nichole posted photos of it back in January of last year. I may have already had it, or I may have gotten it because of her. I have no clue. I'm fairly sure I bought it during one of Zoya's many great sales, but it might have been an Ulta clearance bin find. It's so me that I may have had it for ages. I've got a serious weakness for colors like this, after all. This is three coats and it applied beautifully. Orly Le Chateau is a blackened teal crelly. This was a "newbie" purchase, from maybe July of '12. Back then I was still in BUY ALL THE THINGS mode and I wasn't really reading reviews. I saw it for what seemed like a good price at the time ($4-ish, I think) on beautydeals.net and got it with what has mostly turned out to be a big box of regret. This is just two coats, which is decent for a crelly...but it got pinprick bubbles and it's so dark that it might as well be black. Blah. Between this, Au Champagne (which looks VILE on me), and Royal Velvet (I already had Mysterious Curse, dammit! )...Oui was really the only good choice in the bunch. Live and learn. Le Chateau might be headed for the frankening box. I saw a million bottles of Revlon Essence at Big Lots recently in two packs (I bought it, of course), so it probably is discontinued. And I think a good 60-70% of my huge nail polish collection is untrieds. ;_; I really need to start taking care of that. Yeah, I thought I might have seen it there too. Shame, since it's so pretty!